Most homeowners prefer to handle plumbing problems in their home on their own but not all plumbing problems have DIY solutions. Knowing the difference between a typical clog that you can repair yourself and major problems/repairs that need to be handled by a plumber can save you time and money by avoiding major property damage due to DIY repairs. Not sure how to tell the difference? Here are 5 signs it’s time to call a plumber. 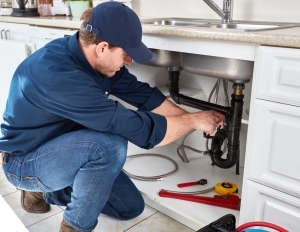 Whenever you’re installing new appliances or going through a major renovation, especially in the kitchen, it’s important to always call a professional plumber to do the work for you. More often than not, kitchen renovations require moving appliances to different areas in the space, which will require water supply lines to be moved. Moving these supply lines and drainage systems on your own can result in major damage to your home, which will be expensive to repair. Better safe than sorry! A sudden drop in water pressure can be hard to diagnose but a professional plumber will know exactly to look for and will provide an appropriate solution. Many times a drop in pressure can be due to a hidden leak, pipe obstruction, or city supply issues, which can be frustrating and annoying to find on your own. A common problem during the cold winter months, burst pipes can cause major flooding and extensive damage to your home. By calling a professional plumber immediately after experiencing a burst pipe, the pipe will not only be repaired properly the first time, but the water abandonment process will begin immediately. If your home experiences flooding due to a burst pipe, the water can leak down into your foundation and a professional plumber will be able to target any concerns with your foundation. When your sewer line is blocked by tree roots, a build-up of non-flushable items, or sediment build-up, your home will begin to experience frequent drain clogs. After a while, this can become frustrating. By calling in a plumber, the cause of the blocked pipe will be target quickly and a safe repair solution will be provided. If the blocked pipe is due to a cracked or punctured sewer line, you’ll be able to avoid damage to both your home as well as your neighbors. Sewer odors can be the sign of a sewer line problem. If you notice sewer odors inside or outside of your home, call a professional plumber as soon as possible to target the cause of the problem to avoid a major sewer line backup into your home. Are you planning a home renovation or are experiencing any of these problems? Give A+ Plumbing, Heating & Cooling a call today at (603) 518-5777.